These days much of what constitutes Vancouver’s crazed real estate scenario is taking shape around the urban False Creek shoreline. Glassed-in condo towers in various stages of completion compete with new, nearby downtown towers, including one named Trump. This week I chanced upon what’s at the bottom of much of what’s going up around False Creek; buried treasure from years gone by. Logs. Huge logs. In what was the industrial heart of Vancouver, over a dozen sawmills, planing mills, shingle mills and wood preserving plants once operated on this 66 hectare strip of waterfront land called Pacific Place. According to the BC Ministry of Environment, most of this land was created by filling in False Creek with construction debris, industrial waste, and fill from other downtown Vancouver building sites. According to the Pacific Place Remediation Project, studies conducted at Pacific Place show that the volume of fill material is enormous – more than two million cubic metres (enough to fill two BC Place-sized stadiums to the rim). The fill is up to 13 metres deep in some areas along the existing shoreline. 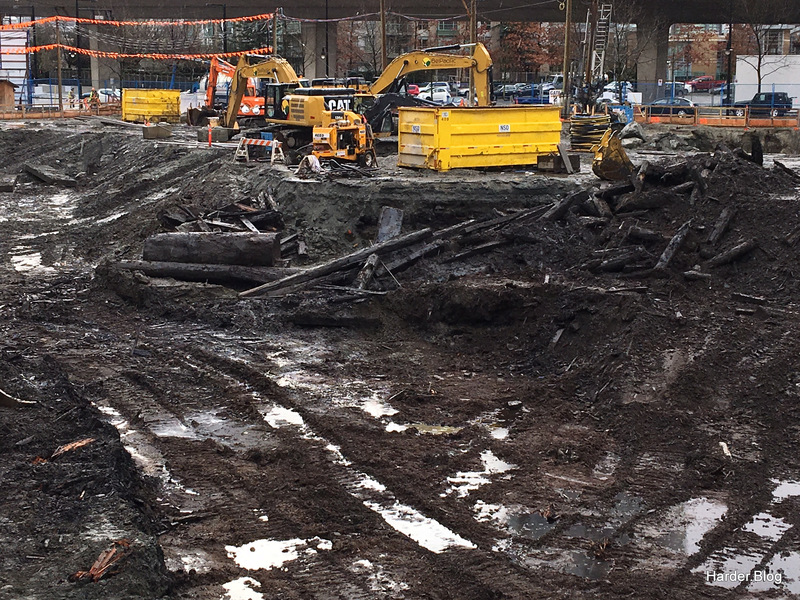 Construction workers and even one pedestrian lumber trader were amazed to note the size of some of the buried logs uncovered during present excavations for The Arc Vancouver condo tower on Expo Boulevard at the foot of the Cambie Street bridge. Interesting stories abound on the history of coastal sawmills and the forest industry that was the early economic engine in these parts. We can now add “back-to-school distractions” to the long list of conflicting forces presently shaping lumber markets. According to the Random Lengths Midweek Market Report, “Hot weather, back-to school distractions, and vacations contributed to the lethargic pace” in recent days. Traders likely consider China, multi-family trends in ‘house construction’, abundant global fibre supply, and a weak Canadian dollar to be more impactful factors at the moment. Even the October 12th expiry of the Softwood Lumber Agreement (SLA) is now in sight. In midst of one of the worst wildfire seasons on record, the Framing Lumber Composite Price has actually drifted lower since peaking in early July. Before the SLA expires, it’s possible that a significantly higher export charge could be triggered for just the first eleven days of October. How might that play out? Meanwhile, we’re told here “for softwood lumber prices to rise meaningfully, Canada’s lumber industry will have to reduce its current overproduction.” It’s interesting to note that ‘overproduction’ has been one among many characterizations said to have been impacting cyclical lumber pricing patterns over the past 20 years. In today’s post-beetle world, the rationale for perceived “overproduction” strategies among the province’s largest producers is complex, if not confusing to many. When BC’s BigTree Registry came into the possession of the University of British Columbia in 2010, “it was a mess of paper records” reports The Vancouver Sun. Confirms Sally Aitken, professor of forests and conservation sciences at UBC: “It consisted of several bankers’ boxes of paper records, maps of various sorts and qualities, some photos and then there was just a single list of trees. It was not something that people could really access information from easily.” Access for all is now just a click away at the impressively concise UBC Faculty of Forestry BC BigTree Website which includes a link to the Registry. Perusing the Registry, it seems safe to presume the giant tree we encountered last month on a visit to Vancouver Island is identified as tree #102. The biggest Coastal Douglas Fir in Cathedral Grove, the registry verifies measurements for tree #102 as: height 70.1 metres, circumference 10.11 m, crown spread 20.7 m. With a “score” of 645, the tree is presently ranked number 8 in the province, species Pseudotsuga menziesii. 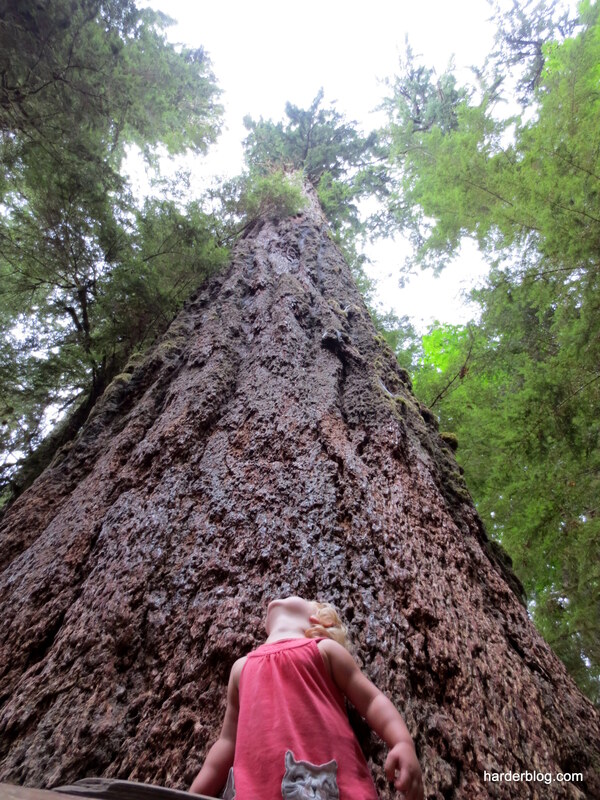 It was particularly interesting to discover that two Douglas Fir trees located here in North Vancouver are even bigger. With scores of 675 and 673, they presently hold the number four and five rankings on the list of champions. BC Big Tree Registry ID #102, Cathedral Grove #1 ?? Maybe we’re being tricked into believing that summer never ends around here. No question the endless summer contributes to enjoyment of vacations past – even recent ones. The images below are from our Labour Day Weekend trip to the McLean Mill National Historic Site.. aboard the completely restored 1929 Baldwin ex-logging locomotive at the 1912 CPR Station. The track winds through the City of Port Alberni and then the surrounding forest for 35 minutes each way. 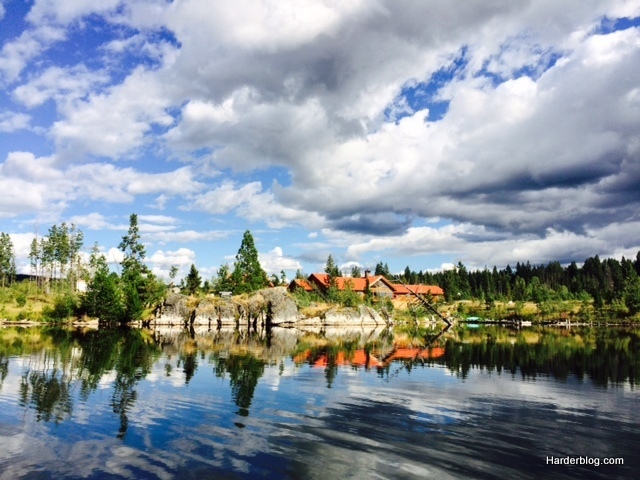 At the same time, proof that summer might not really be endless, even if this province’s teachers strike make it seem so, is offered to us in the release of Jim Snetsinger’s report on Area-Based Forest Tenures which includes results of the public engagement process described in an earlier post here. Chances are increasing that somebody will hear it. That according to this report at fastcoexist.com, which tells the fascinating story of an engineer who sought solutions to the problem of illegal logging. 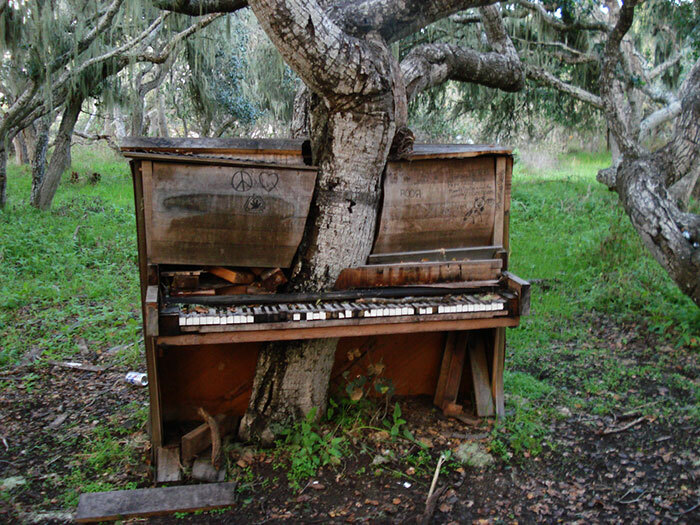 “In huge forests around the world, it’s just too easy for someone to cut down trees when they know they won’t get caught. It’s impossible for governments or nonprofits to patrol vast remote areas,” we’re told. Log exports have long stirred more controversy in B.C. than blog exports. For one thing, there are more regulations imposed on log exports than blog exports in this province. It’s mostly readers who determine acceptable blog reporting in this space. In today’s Vancouver Sun, an associate professor of economics at Thompson Rivers University in Kamloops argues that many of the rules surrounding log exports impose needless costs on producers and owners. He points to a new study on log export policy for B.C. which concludes that a combination of free trade in logs and the export quota policy now in place yields much larger benefits to B.C. than an outright ban on log exports. In fact, “streamlining the export process, while continuing to restrict exports, will ensure B.C. gains the most value from its forestry resources,” we’re told. According to the professor, “free trade in logs is a more desirable policy when a global perspective is incorporated.” In the face of China’s fibre deficit no doubt, he explains that if all log export restrictions were removed as part of an Asia-Pacific trade agreement, concessions of a similar size could be leveraged to the benefit of B.C.